If your child has been diagnosed with type 1 diabetes, it’s important you know how it can affect their body now and throughout life. Certain health conditions are related to type 1. You can help your child by knowing what can happen and what to look for. Proper care of the disease, plus diet and exercise, can manage and even prevent complications from diabetes. The A1c gives you a good idea of how well your child's diabetes treatment plan is working. It measures his average blood glucose levels over the past 2 to 3 months. The glucose levels can change from day to day, so having this average gives you the best sense of what's really going on. The American Diabetes Association recommends an A1c level of lower than 7.5% for children. If your child’s blood sugar stays high over time, it can damage the body and cause health problems. Blood glucose problems are common and can become serious if they aren’t treated. Hypoglycemia is a condition that can happen when glucose levels are low. It’s sometimes called insulin shock. You can treat hypoglycemia by having your child eat or drink 15-20 grams of glucose, which is equal to a handful of raisins or a half cup of juice. Repeat these steps until the blood glucose gets back to normal. If you don’t treat low glucose levels, your child can pass out or even slip into a coma. Glucagon is a hormone that makes your liver release glucose. You or someone else may need to inject it into your child’s bloodstream to wake them up. Check with your child’s doctor about this. Hyperglycemia happens when there’s too much glucose in the bloodstream. Your child might feel thirsty and take more trips to the bathroom than usual. In severe cases, it can cause a serious problem called diabetic ketoacidosis (DKA). DKA happens when the body can’t use glucose properly, and it releases chemicals into the blood called ketones. When ketones build up, it can cause coma or even death. You can prevent DKA by keeping close tabs on your child’s glucose levels. If you see signs of DKA, see a doctor right away. The risk of having celiac disease is 10 times greater when you have diabetes. With celiac disease, the body reacts to gluten -- a protein in wheat, rye, and barley -- by attacking the small intestine. The damage can keep your child from getting the nutrients he needs. Symptoms for adults are different and usually don’t show up in their digestive system. If your child has celiac disease, a doctor will likely recommend switching him to a gluten-free diet. Symptoms usually improve once you make that change. Kidneys filter salt, water, and waste out of blood. Diabetes can cause problems with the blood vessels that deliver blood to the kidneys. About 30% of people with type 1 will have kidney failure at some point in their lives. Children are typically checked 3-5 years after being diagnosed with type 1. A doctor may use medications called ACE inhibitors to slow down kidney disease. 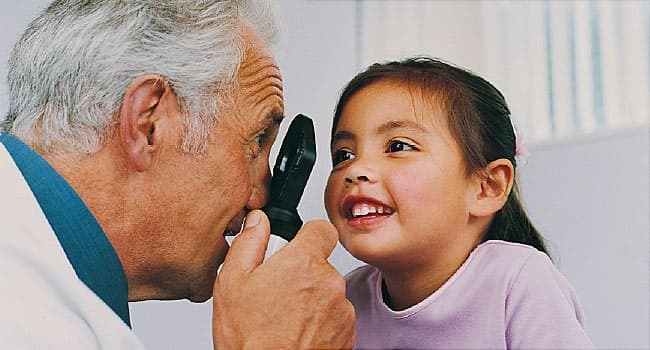 Your child will need regular eye exams throughout life. Make sure your doctor knows your child has type 1 so he can catch and treat any potential problems as soon as possible. Kids are usually tested for eye issues 3-5 years after they're diagnosed with type 1. One potential problem is diabetic retinopathy, which causes damage to the retina. That’s the area at the back of the eye that tells your brain what you’re seeing. The longer your child has diabetes, the higher his chances of developing retinopathy. Usually, symptoms don’t show up until the condition is already severe. That’s why regular visits to the eye doctor are so important. Treatments for retinopathy may include medication, laser treatment, or surgery. Feet, hands, arms, and legs. They may lose feeling in their limbs, or they might become weak or have burning, tingling, or cold sensations. They might get sores on their feet. Bladder. It may be hard for your child to know when to go to the bathroom, or they may leak urine. Digestive system. They can have trouble swallowing, stomach pain, nausea, diarrhea, constipation, or vomiting. Sweat glands. They may sweat a lot while sleeping or eating. Eyes. It may be hard to see changes in light. Heart. Heart rate and blood pressure are both controlled by nerves. Your child may become dizzy, short of breath, or even faint because of nerve damage. Injured nerves can also mask symptoms of low blood sugar. This is more likely to happen in people who have had type 1 for a long time. There’s no way to cure nerve damage, but you can treat the symptoms. A doctor can prescribe medication for specific pain or suggest lifestyle changes, acupuncture, or physical therapy to help manage the symptoms. He may also suggest certain vitamin or fatty acid supplements. Diabetes is strongly linked to cardiovascular disease like heart problems and stroke. Adults with diabetes are two to four times more likely to have cardiovascular disease than non-diabetic adults. Eat plenty of fiber and less saturated fat and sugar. Get support to stay on track.